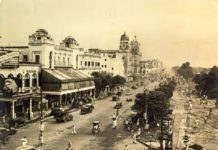 On the morning of Baisakhi, Colonel Reginald Dyer had announced the implementation of a curfew throughout Amritsar and a ban on all processions that even prohibited a group of 4 or more people to meet publicly. 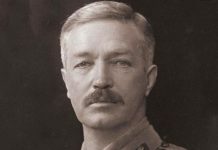 At about 12:40 PM, Dyer received confidential information about the meeting taking place at Jallianwala Bagh that may result in riots and protests. 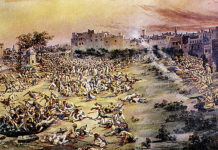 By mid-day, thousands of people were gathered at the Jallianwala Bagh including the devotees at Harmandir Sahib. 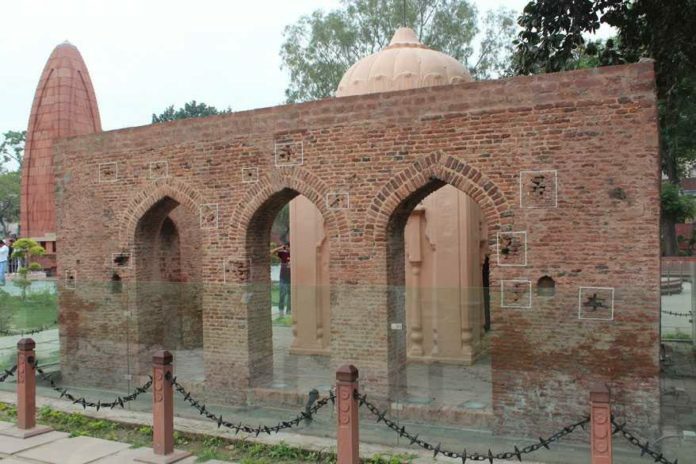 Jallianwala Bagh was covered on all sides by walls reaching up to 10 feet. It is equipped with narrow entrances, most of which were locked. The place was flocked by the devotees, traders, farmers and merchants who visited Amritsar to enjoy the festival and witness the Baisakhi horse and cattle fair. Sensing the number of people present there and the secret meeting that was going to take place at 4:30 PM, General Dyer arrived there with armed troops. The main entrance was also guarded by the armed troops. There were armoured cars accompanying the troops that were supposedly carrying machine guns and explosives. On Dyer’s orders, there was ruthless firing done on the uninformed crowd. There were about 25,000 people present there at the time of firing. Some tried to escape while some choose to jump in the solitude well built in the premises of Jallianwala Bagh. The troops were ordered to start shooting from the most densely crowded spot to harm the maximum number of people. This heinous act of violence resulted in extreme mass killing. The firing continued for about 10 minutes, and it only ceased when the ammunition supplies were almost exhausted. The scattered dead bodies could not even be moved due to the implemented curfew. Colonel Dyer reportedly carried out this firing not just to disperse the meeting, but to punish the Indians for disobeying their orders. In a telegram sent by British Lieutenant Governor of Punjab, Colonel Dyer’s actions were supposed to be correct and approved by him. Further, the British Lieutenant even asked the Viceroy to implement martial law in Punjab.